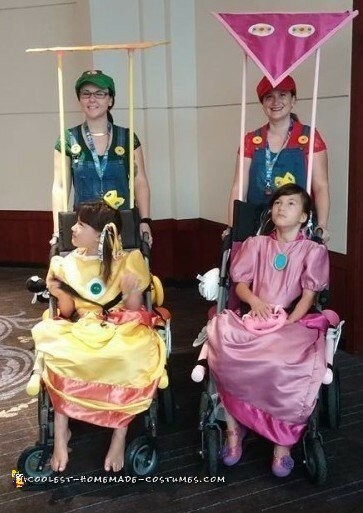 I made these Princess Daisy and Princess Peach costumes for my daughters who are severely disabled from a double dx of CDKL5 and mitochondrial disease. 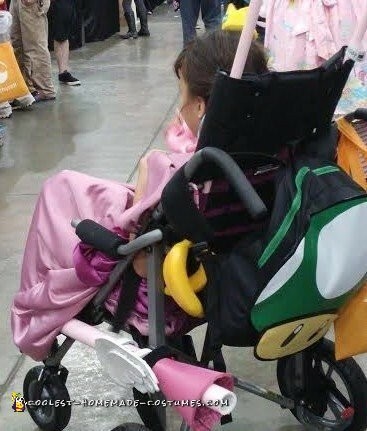 I challenged myself to make a costume using their wheelchairs. They would pull off anything on front so I was limited to the sides and back. The costumes are for Halloween, but we debuted them at Anime Weekend Atlanta, and we recieved an overwhelmingly positive reaction! It was amazing to see people react to my girls as fun instead of awkward stares. I hope to bring disability awareness with this. My friend helped me make the girls’ dresses. I found the pattern and fabric and she sewed it under my directions. I cast the gems on the dresses out of clear resin I dyed. The turquoise gem is encased in thermoplast painted with acrylic. The daisy I made with muslin and fusible backing. I made the girls’ hair accessories: the crowns are felt, cardboard and barrettes with sew-on gems, the hair bows I choose the ribbon and cut and knotted it together. I made the exhaust pipes and wings out of PVC, EVA foam, velcro and spray paint. The gliders are the matching fabric to the dresses, iron-on transfers, dowel rods, electrical tape, thermoplast and spray paint. I designed and made all these parts myself, including the kites. The Mario and Luigi costumes are mostly bought. I did make the button “threads” out of thermoplast and the StarMan earrings out of polymer clay. 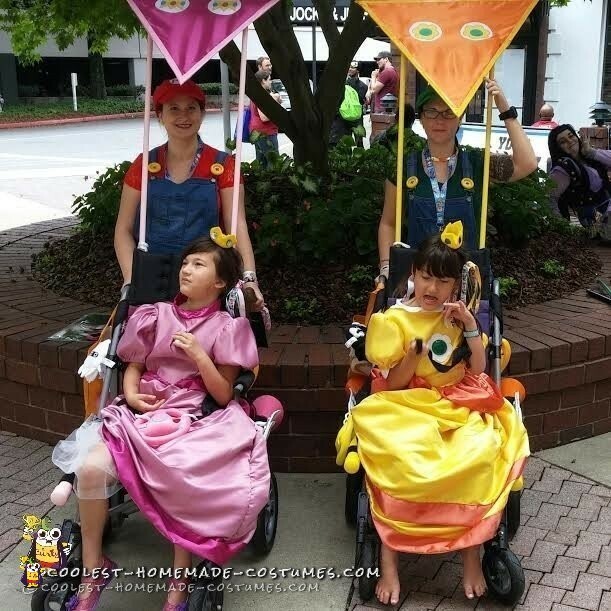 My focus was mainly on the girls’ Princess Daisy and Princess Peach costumes! 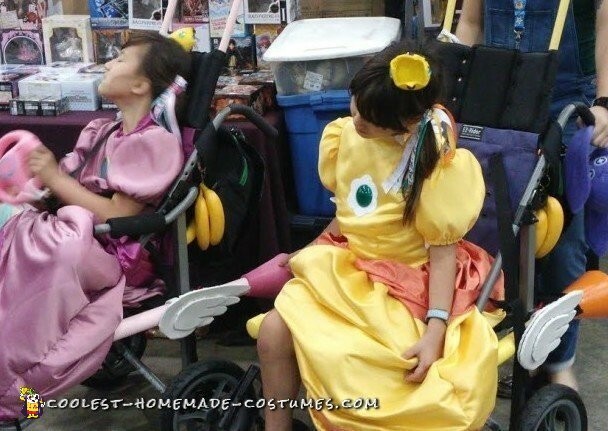 For additional touches, I had mushroom backpacks, plush weapons and styrofoam bananas I sewed together and rigged to the chairs. They threw joke weapons such as bananas in the game.